Got some exciting news for Wild Cards fans... and for fans of audiobooks. We've got a new deal in place for Wild Cards audiobooks. This time we've signed with Random House Audio, the same good folks who have been bringing you the great audiobook versions of A SONG OF ICE AND FIRE, as well as ROGUES, DANGEROUS WOMEN, and my other anthologies. Brilliance Audio did the audio editions of the first two volumes in the series, WILD CARDS and ACES HIGH, the last one coming out in 2011. 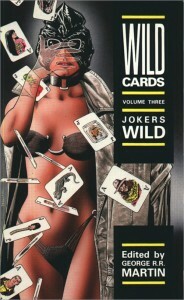 Random House will be picking up the series with the third volume, JOKERS WILD, the first of our full-on mosaic novels. Luke Daniels was the reader for the two Brilliance volumes, and did a fine job. But as long time fans of the series know, the Wild Cards books are team efforts featuring interwoven stories by a number of different writers set against a common background. Even in a shared world, however, not everything is shared; every writer has his own characters, and every character has his own voice. Random House Audio wants to capture that with these new audiobooks. Instead of a single reader, therefore, JOKERS WILD and the volumes to follow will feature a multiplicity of narrators, a different voice for every viewpoint character. JOKERS WILD, the first of our full mosaics, is a seven-way collaboration, set on the fortieth anniversary of the first Wild Cards Day in New York City. All the action takes place in twenty-four hours, and is seen through seven sets of eyes. The writers (and their respective viewpoint characters) were Lewis Shiner (Fortunato), Melinda M. Snodgrass (Roulette), John Jos. Miller (Wraith), Edward Bryant (Sewer Jack), Leanne C. Harper (Bagabond), Walton Simons (Demise), and your truly (Hiram Worchester). Ron Donachie, reading Hiram Worchester. Recording is taking place in London, Edinburgh, Denver, Taipei, Toronto, Burbank, and Los Angeles; we went all around the world to assemble this team. I can hardly wait to hear how this amazing group of actors bring our characters to life. Hallo grrm, besides reading of course, how do you come up with those excellent dialogues?